Nuedexta is a drug used to manage a medical condition called pseudobulbar affect or PBA. PBA is characterized by episodes of inappropriate, sudden, and uncontrollable crying or laughter. PBA is common with people who have brain injuries or people who have certain neurological disorders. These disorders can include amyotrophic lateral sclerosis and multiple sclerosis. Many want to know all about Nuedexta drug and its uses. This is understandable since everybody wants to make sure that they are taking the right medicine for their medical condition. If the doctor does not provide enough information, people tend to research on their own to know more about the drug that they are taking. PBA is also known as emotional lability or incontinence. This refers to patients who have a sudden urge to burst out laughing or have the tendency to cry involuntarily. These patients may have neurological disorders which can trigger laughter in a moment that is not even humorous in the slightest. The patient can give an emotional response that has an exaggerated intensity. For example, they can cry loudly in response to a slight problem instead of a more typical sigh. The drug is a combination of dextromethorphan and quinidine. This is the very first drug that the Food and Drug Administration (FDA) has approved for the treatment of pseudobulbar affect. The main component which is called dextromethorphan hydrobromide is an active ingredient that affects a person’s central nervous system. You can know more about the molecular formula of dextromethorphan by clicking this link. Dextromethorphan alone is used to relieve coughs that do not have phlegm. This is a kind of suppressant that decreases the brain’s feeling of needing to cough. Quinidine sulfate is used to increase the bioavailability of dextromethorphan. Bioavailability is the fraction of the compound that reaches a person’s bloodstream after taking the medicine orally. Quinidine affects the heartbeat of a person. This is often used to treat people with erratic heart rhythm disorders. The drug is composed of 30 mg of dextromethorphan and 10 mg of quinidine. The medicine should be taken exactly as your doctor prescribes it. This is according to the website: https://www.nuedexta.com/starting-nuedexta. For week one, your doctor might prescribe only one capsule. This will depend on how the often a patient has episodes of uncontrollable public outbursts. But for the first week, only one capsule is prescribed in order to introduce the patient’s body to the new drug. For week two, the dosage can be increased to two capsules a day. These capsules can be taken with a 12-hour interval. One can be taken in the morning and the other one in the evening. This is often the recommended daily dose for the rest of the treatment period. The drug can be taken with or without food. If you ever missed a dose, take the medicine whenever you remember it. However, if it’s time to take the second dosage, do not take a double dose. You have to make sure that you only take 2 capsules in the space of 24 hours. The two doses need to be at least 12 hours apart. Allergies – Any allergic reaction a patient had in the past should be reported to his doctor as soon as possible. The allergies can include food, dyes, animals, and preservatives. Medicine Interactions – A patient should tell the doctor if he is currently taking medicines. There are certain medicines that would not go well with Nuedexta. Here is a list of drugs that should not be taken with quinidine and dextromethorphan. Tobacco and Alcohol Intake – Tell your doctor if you are smoking or taking alcohol. Certain medicine will not work well with alcohol. Others can develop severe side effects while taking the medicine. 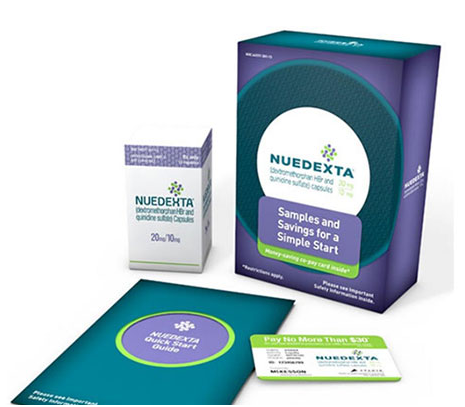 It is important to see a healthcare provider before taking Nuedexta. The doctor can identify symptoms of PBA, can prescribe the right dosage, and can give other bits of advice for a healthy living.